Home MS Office Tips MS Access is NOT DEAD! MS Access is NOT DEAD! Way back to our College years in IT we have encountered alot of Relational Database Management System (RDBMS) software introduce to usby our professors and one them is MS Access. 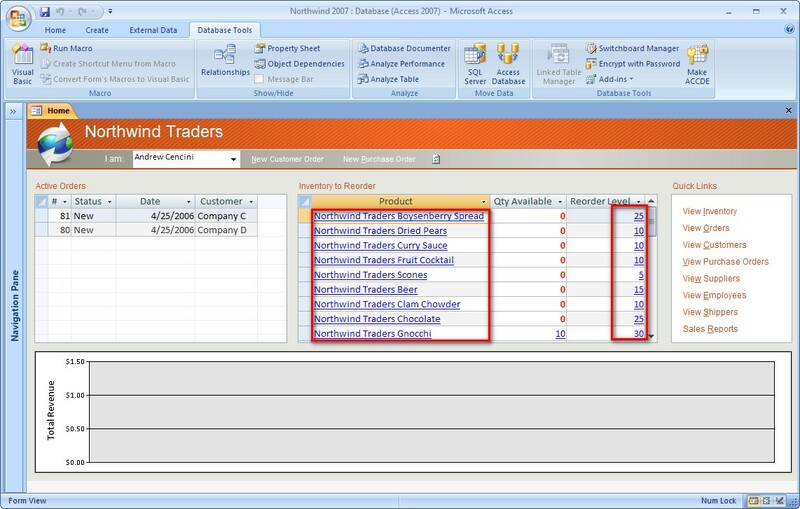 MS access is the most common and the learning ground toother RDBMS. In our first system development project MS Access was the toolexampled to us for better and simpler understanding about RDBMS. But in the endof the course the power of MS access was not told for us instead our instructortold us that MS Access is not an ideal tool for creating an enterprise systemand blah…blah..blah. But now I am going to tell you what are the things I have discoveredin MS Access that make it’s cool for me. To understand how got started read this article. Why I love MS Access? Gate Pass Information System” for the Mall where I work. Thesystem manages thousands of customer records in terms of Pull-Out and Entryactivities. It can also produce a printed reports and I am planning to deployit online using the MS Access 2007 sharepoint functionalities. I have explored MS Access before and build a simple standalone programs but I don’t appreciate it. I move to Visual Studio 2008(VB.net),since I have a background on it during our capstone projects and I study more thingsabout vb.net.Vb.net is really great programming tools, it offers a lot ofdevelopment options and extend your capacities to build more excellent solutions. Last January 2010 I develop a new small project and I needto create a database, search engine, linking menus, file attachment andinterface. 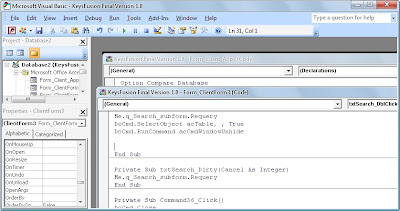 During that time I was bothering of what tools to use whether I’lluse vb.net 2008 + MS SQL or MS Access. My installer DVD for Visual Studio 2008was lost and I have a problem of downloading and finding it the internet. While finding the vb.net 2008 installer in the internet, Istart building my prototypes in MS Access 2007. I create tables, forms, samplequeries and menus. But I am almost finish with my sample designs and take asimple debugging it was successful and suddenly, it makes me interested to takeonline studies about MS Access. I download sample projects and make a trial anderror test, then I am really amaze about the outputs. Imagine with just alittle efforts of codlings and positioning objects and the form I have abeautiful output. Now here are the cool stuffs in MS Access based in myexperiences. 1. 1.Three CommonMethods to Build and Fire-up Events-MS Access works with VBA and it offer 3options to create a events not like vb.net I notice the common one is vbacoding only. a.) MacrosBuilder- is used to automate or run multiple tasks at a time. 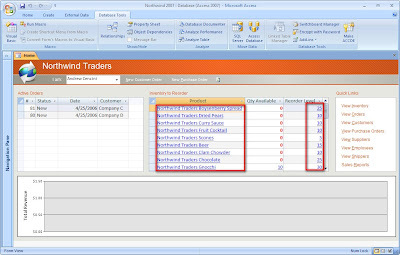 As shown theimage below is the Macro events builder. You don’t need to put a lot of codeson it just select an action, command and create an argument, then you canfire-up a lot of events and could work with other methods. b.) ExpressionBuilder- You can create a simple expression like field calculations, pagenumber, time, date and other manipulations that you couldn’t make it easily inMacros. 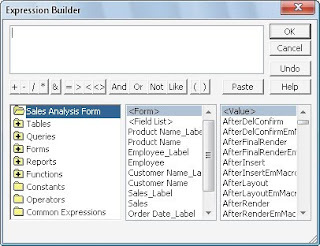 c.) CodeBuilder – This builder makes MS Access create more powerful and robustapplications by putting vba codes . Apart from the 3 common buildersyou can also make you application more dynamic using class modules, API’s and soon. 2. 2. 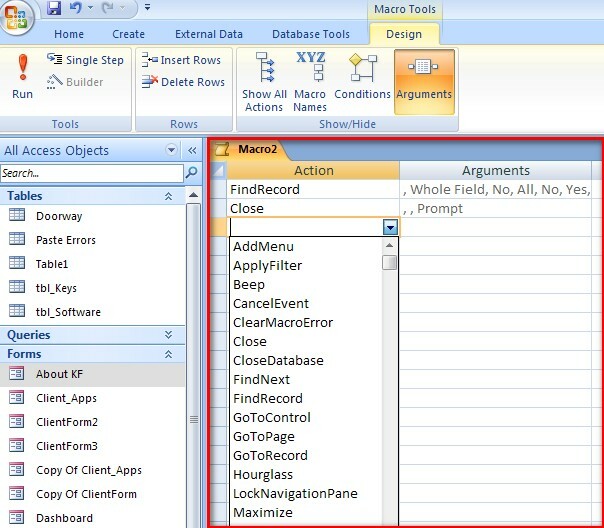 MS Accesssupports RAD-Rapid Application Development which enables you to drag anddrop controls in your forms and you can choose to build your apps by using theWizard or from the scratch as you wish. 3. 3.FileAttachment –You can easily store files up to 2GB (256 maximum per files). Ireally like it because it’s hard to this in vb.net. I can store images,spreadsheets, word files, and also .exe. Files. It supports a lot of imageformats but block file format for security purpose. Tips: Zip your dot exe is file beforeuploading it to your attachment. MS Access attachment field hinders you toupload .exe file directly. 4. 4.HyperlinkOn Screen – is very unique and amazing tool. 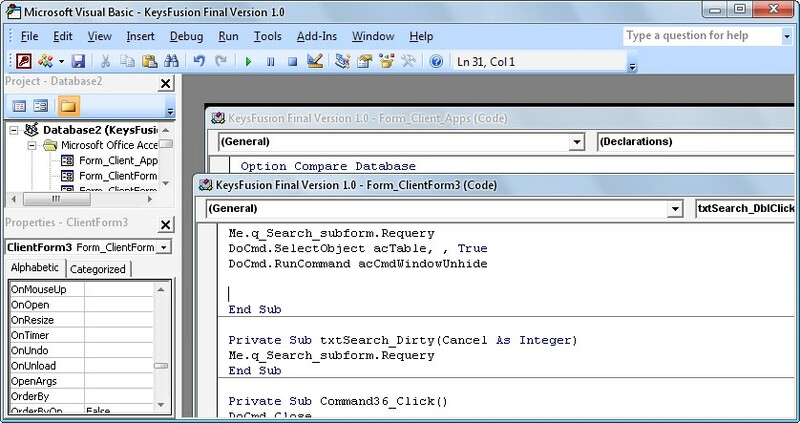 I believe you can do this inVisual Basic but not as fast in MS Access. It is helpful to your system users whenthey navigate the record by clicking those link items and the whole detail willbe displayed. 5. 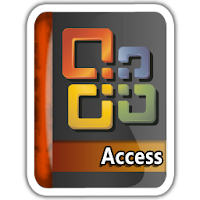 5.MS Accessis Light-MS Access setup is only almost 700mb together with other MS Officeapplications that is very light to install and easy to download. MS Accessenvironment do not consume much computer memory. So, you can build and debug anapps even your PC is slow and old. There is lot of amazing geeks in MS Access that I haven’t discoveredyet. I’ll tell you more soon as I am exploring it more. MS Access is not Enterprise Software? In edition talks, MS Access have noEnterprise Edition unlike Visual Studio has. But it’s wrong to say like you can’tbuild an ERP in MS Access. During my college years our instructors really forceus to build an ERP in vb.net because they insist that MS Access is not for ERP buildingtool. We can’t object them because they’re ignorant too and we suffer much onthe development where we start Visual Studio 2008. But why MS Access is not anERP building tool? Why during the time that there’s no VB.net some scholarsclaim that MS Access is good for an enterprise solution. I will research about it and you might as well. I have no intention to say that MS Access isbad or the VB.net because both them is a tool to create a better system forhumans. All I can say is, find a tool that you are compatible to use or let saya user friendly and feasible for you.